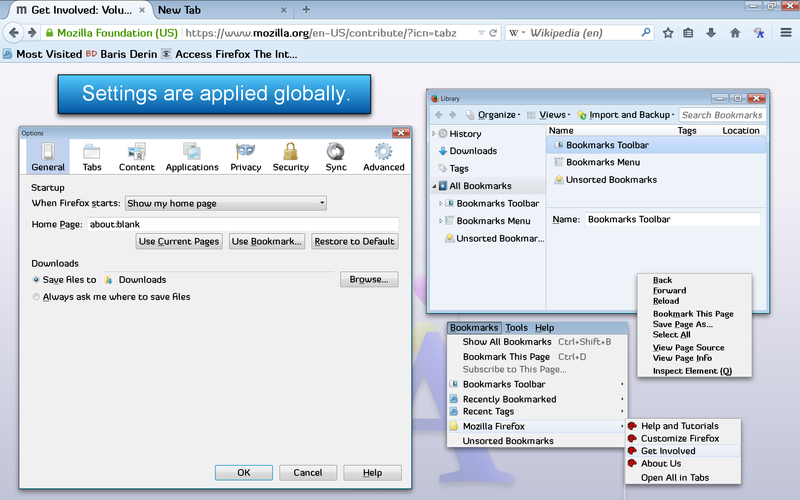 There are many Firefox add-ons that provides you with the means to enlarge and reduce text on web pages. 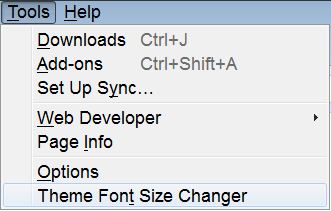 Theme Font & Size Changer allows you to change the global font (using your system's fonts) and font size for Firefox itself meaning for all windows, menus, toolbars, etc. There are several other customization options as well. Theme Font & Size Changer was created to be an accessibility aid for persons with visual impairments and for those without a perfect visual acuity, but it's also useful for Firefox users with high monitor resolution settings and wide screens. It is also available for Thunderbird and SeaMonkey. While Theme Font & Size Changer was initially designed to be used with Firefox's default theme, it does work with other Firefox themes but you may come across some compatibility issues. For example, some elements within Firefox may retain the (non-default) font size setting that the theme developer chose for their theme. There are no known compatibility issues with Personas. 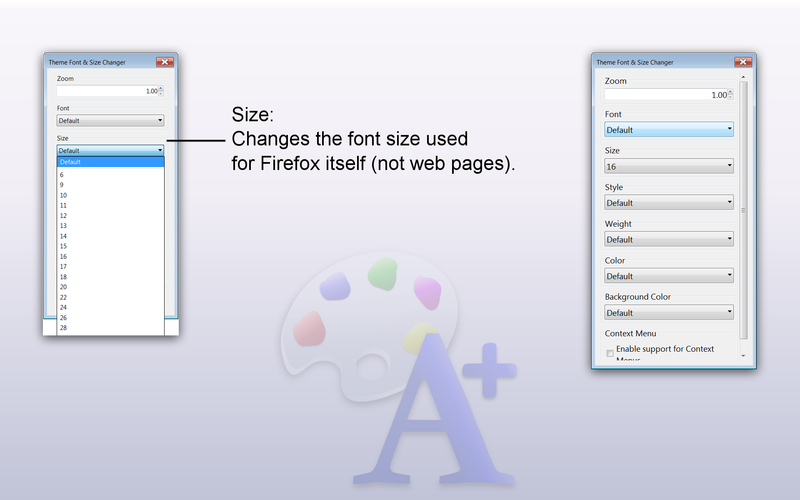 There are several ways to access Theme Font & Size Changer's menu to customize your Firefox. Once you have opened the options panel, simply select a value from one of the drop down menus and it will be applied instantly and globally. A "Normal" (default) value is also provided so that you can quickly reset your settings back to default ones. Tip: You can cycle through fonts to see how each one would look like when applied by hitting the up or down arrows on your keyboard when the font field is highlighted. Same applies to font sizes. Some Dingbats, Wingdings, etc, may temporarily freeze up Firefox while they are being loaded. It's best just to skip past them quickly. You can read descriptions for each setting below or view the descriptive screen shots. 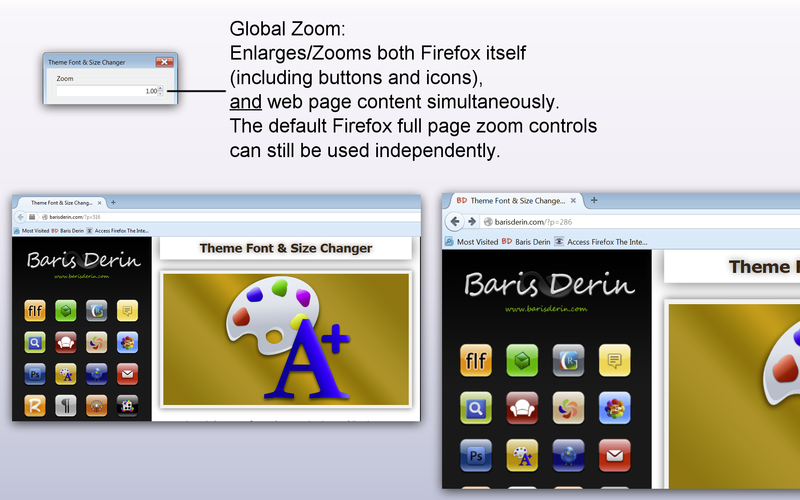 This is a global zoom feature that enlarges/zooms both Firefox itself (including buttons and icons), and web page content simultaneously. 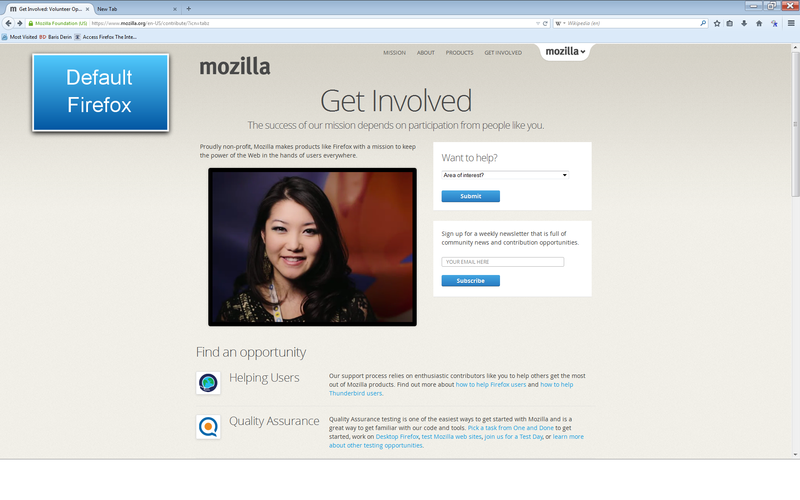 The default Firefox full page zoom controls can still be used independently. 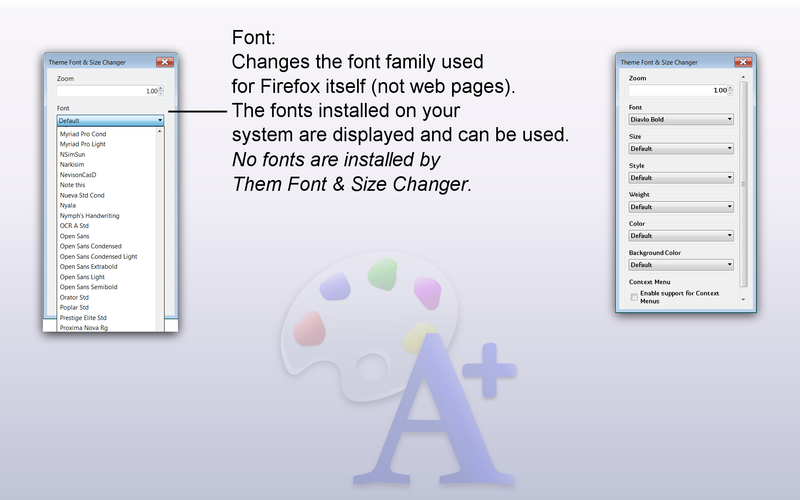 Changes the font family used for Firefox itself (not web pages). The fonts installed on your system are displayed and can be used. 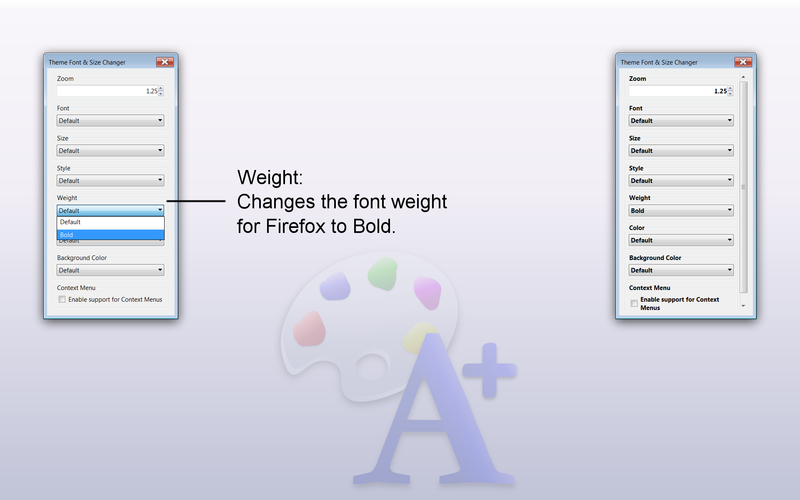 Changes the font size used for Firefox itself (not web pages). 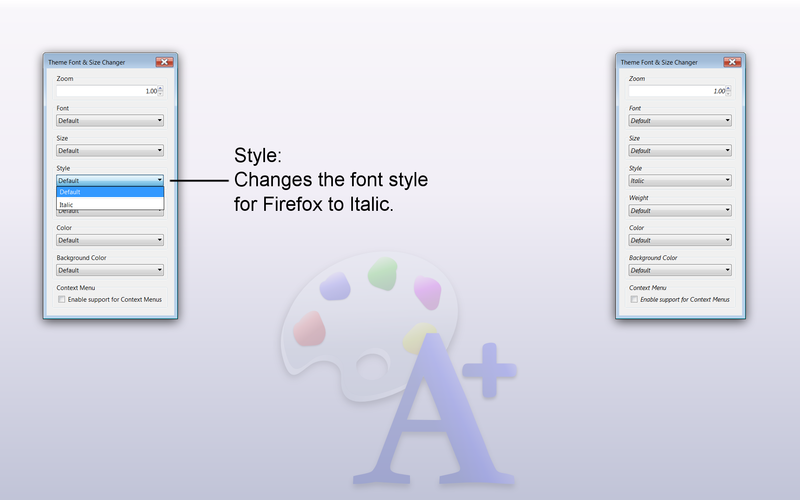 Changes the font style for Firefox to Italic. Changes the font weight for Firefox to Bold. 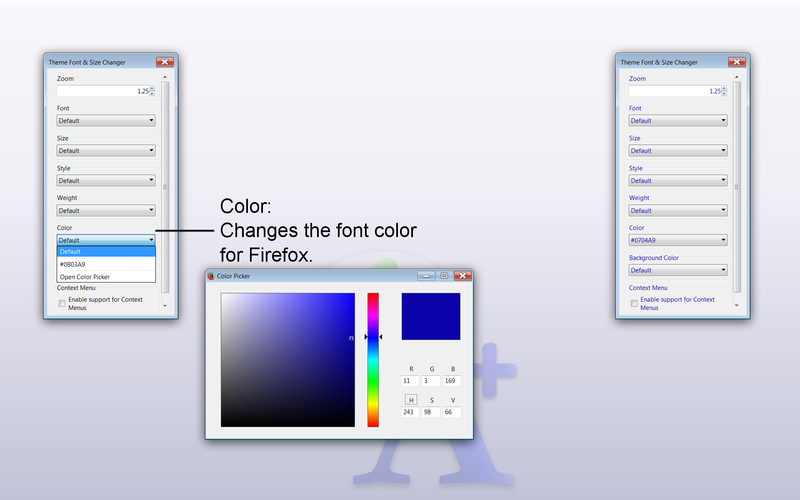 Changes the font color for Firefox. 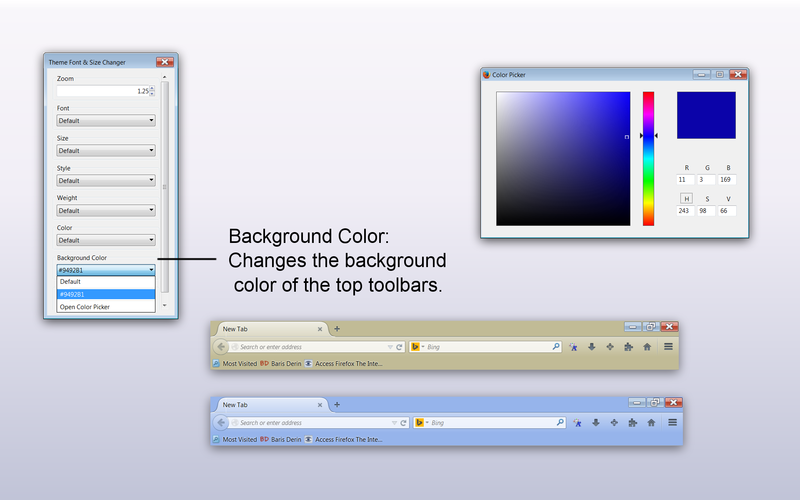 Changes the background color of the top toolbars. 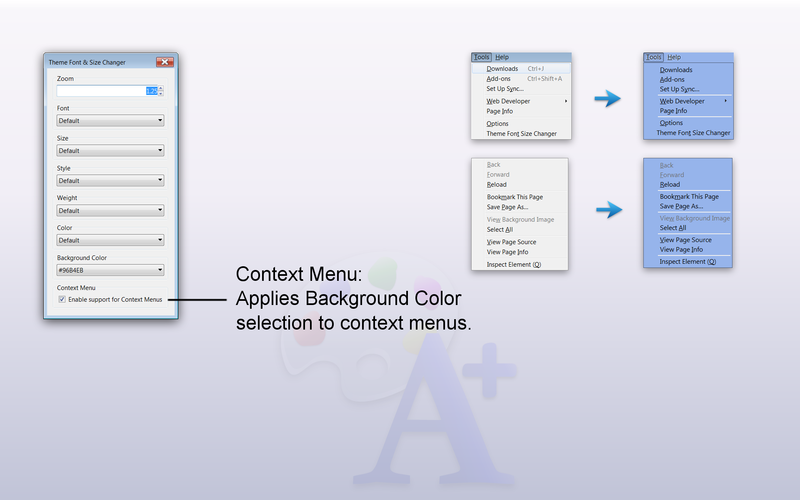 Applies Background Color selection to context menus. You can cycle through all of the images by using your keyboard's right and left arrow keys, or by clicking on either the right or left hand side of an image (once it's enlarged). Close the image by pressing the Esc key on your keyboard or by clicking on the close button at the top right of the image. Very special thanks to Baris Derin for writing Theme Font & Size Changer. It is an extension that I first sought out a developer for to make it in 2005 and 5 years later, Baris is the one who finally stepped up to the plate to get it made. Be sure to check out these other great add-ons by Baris Derin. "Reader is the ultimate Reader tool that brings the Safari 5 Reader features to Firefox and helps you read more of the web by transforming text on any website using fonts, colors, and layouts of your choosing." Automatically rotates your Personas Favorites. Install and display full sized backgrounds (wallpapers) in Firefox from the browserbackgrounds.com community site, or use your own. Firefox add-on that allows you to change and rotate your desktop wallpapers. You can get wallpapers from the wallpaperrotator.com community site, or use your own. 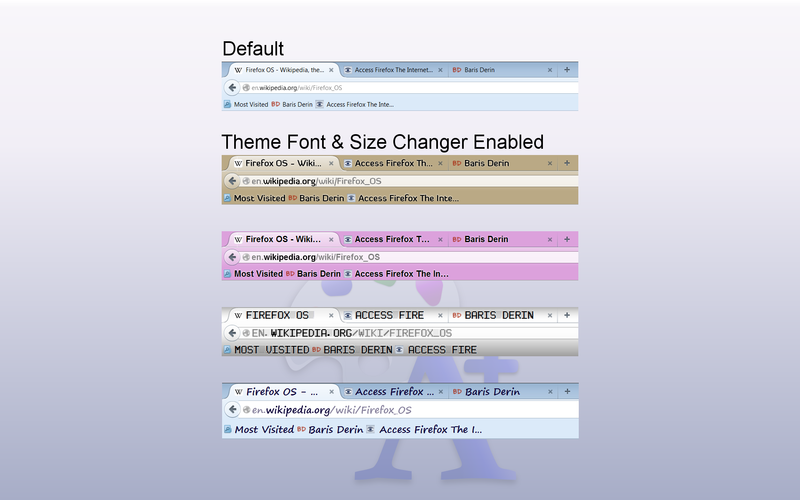 View all Firefox add-ons by Baris Derin. 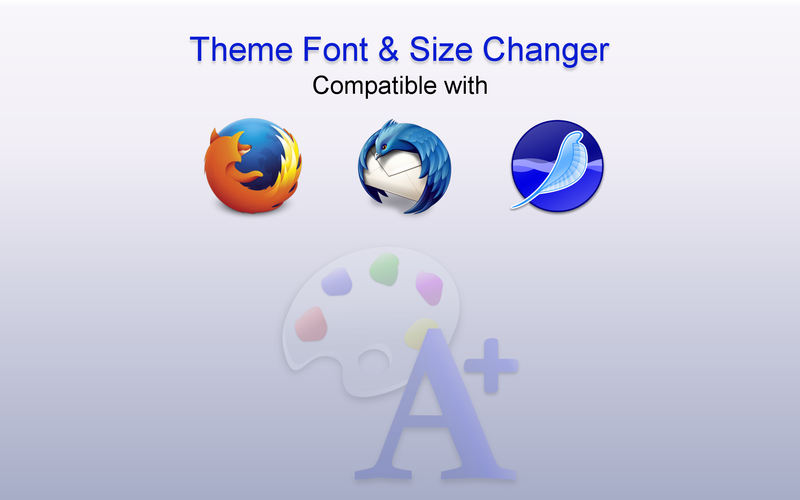 Theme Font & Size Changer palette icon is based on the Kempelton Theme.svg icon by Arvid Axelsson. 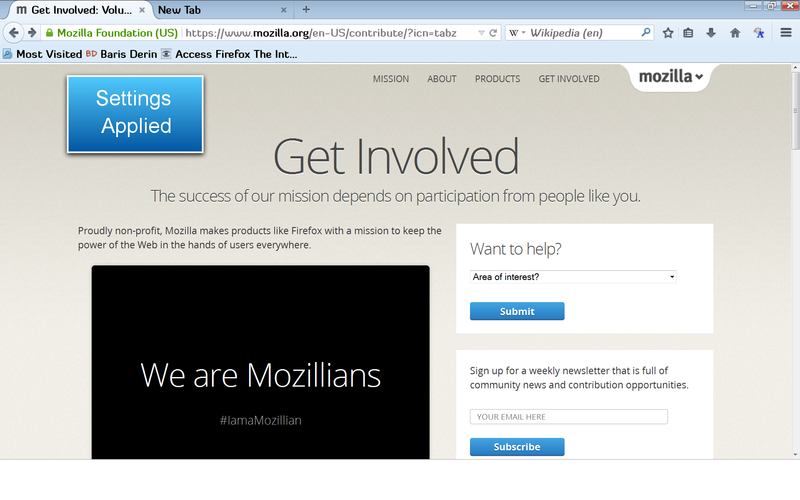 Access Firefox, a Mozilla community run project. This site is not officially affiliated with the Mozilla Foundation or Corporation. Domain name licensed by the Mozilla Corporation 7-17-2008. Where clearly stated, this site's content is available under a Creative Commons license. All other content is ©2005-2017 www.AccessFirefox.org.